We had a leisurely start to the day since breakfast didn’t start until 9am. I was not very impressed with breakfast it has to be said. I usually have muesli, yoghurt and fruit. It lines my belly well and keeps my energy up all morning. They had muesli, but no fruit (except a single manky apple) and no yoghurt. I left the table a wee bit hangry. Not a great start to the day. Luckily while we were out walking down at the beach I found a great little cafe that served a good latte and sandwiches. Hurrah! We walked uphill to the Captain Cook memorial, along the pier, and then jumped in the car and headed for York. We drove through the Yorkshire moors to get here – very cool. The moors are misty and soft and so different than anything we have at home. Lovely. York is fantastic. It has a cathedral (but called a Minster, to denote that it’s special). 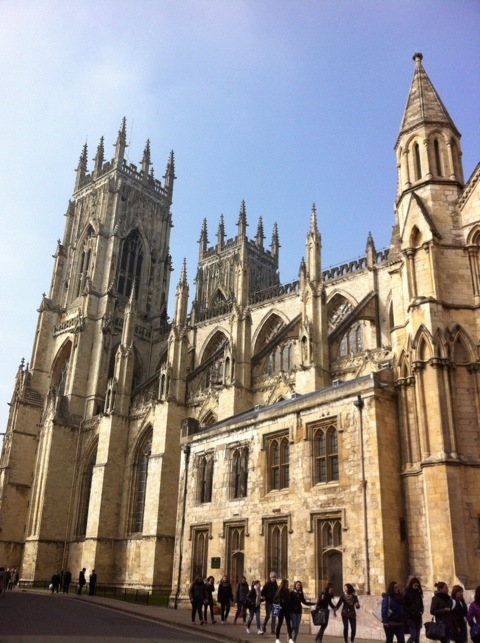 The minster is the seat of the Archbishop of York, the second-highest office of the Church of England, so it’s pretty important. And you can definitely tell as soon as you enter this church – it is obviously more wealthy than any other church we’ve visited. The church is undergoing a £10m restoration at the moment – re-carving the stonework and re-leading the stain glass windows. It’s been going since 2006 and is due to be completed at the end of 2012. It really looks magnificent. It’s a funny thing really, to completely restore the church, since it will eradicate some of the original work that dates from c1100. It’s great that the church will be seen in its full glory, much as it was when first completed, but it will no longer be the same church as it was then. The restoration involves removing the original stonework and replicating it before installing it in place of the original. Some of the original stonework will be kept, and the rest will be sold to fund the continued upkeep of the church. The upside of this process is that it provides a training ground for a large group of stonemasons and other restoration experts who will receive their training here and then take their knowledge on to other places. They are being taught how to carve and work on the cathedral in the manner of the workers who first built it. That’s a cool idea. I’m feeling a bit travel weary today, so the remainder of the day (4pm onward) will be spent lounging in our hotel room and eating. Ahhhhhh.